We’d love your help. Let us know what’s wrong with this preview of The Insistence of Memory by Susan Quilty. Nothing could prepare Joanne for the secrets her husband left behind. As she stumbles through each day, attempting to raise their young daughters alone, Joanne soon learns that Jeff’s basement tinkering had led to a remarkable invention: a machine that can record memories and play them back in someone else’s mind. Now, Jeff’s partner-in-crime wants to turn their unfinished Nothing could prepare Joanne for the secrets her husband left behind. As she stumbles through each day, attempting to raise their young daughters alone, Joanne soon learns that Jeff’s basement tinkering had led to a remarkable invention: a machine that can record memories and play them back in someone else’s mind. Now, Jeff’s partner-in-crime wants to turn their unfinished project into a money-making scheme, while Joanne’s best friend argues the dangers of dredging up buried memories. Joanne’s heartache must take a backseat as she struggles to find balance between supporting the future of Jeff’s incredible discovery and keeping her own troubled history safely locked in the past. The Insistence of Memory gently bends reality to let readers explore the truth of what we remember. What is real? What is blurred? What would we never want revealed? To ask other readers questions about The Insistence of Memory, please sign up. From my Amazon Review: There are few books these days that cause me to set aside everything else and get the kids to bed early because I can't put it down, but this novel - and a debut by this author at that - caused me spend three hours glued to my screen, which is a feat in itself. I'm not an e-reader fan and have never been able to get through a book unless it was a paperback. So the "Insistence of Memory" was a first in drawing me in so much that I just had to keep reading. The writing itself From my Amazon Review: There are few books these days that cause me to set aside everything else and get the kids to bed early because I can't put it down, but this novel - and a debut by this author at that - caused me spend three hours glued to my screen, which is a feat in itself. I'm not an e-reader fan and have never been able to get through a book unless it was a paperback. So the "Insistence of Memory" was a first in drawing me in so much that I just had to keep reading. The writing itself I can only describe as delicious; I just wanted to savor every word, but at the same time it was so good I wanted to devour it all at once. The story was even better. I thought I knew what was going to happen, then I didn't, then I thought I'd figured it out again, only to doubt myself again. If there's anything to compare it to, it's the emotional roller-coaster that the series Homeland put it's viewers through in the first season. 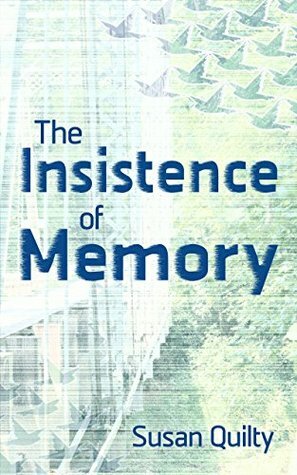 The subject(s) covered in the book; memory, trauma, the power of the brain (and the ease as to how it can be manipulated) are fascinating and presented without pretense in a way that flows so easily throughout the entire book, and left me wanting more. A pretty good read. Part who-done-it, part Sci-fi but overall a book that makes you think and makes you wonder. And Susan Quilty is a local author and was kind enough to visit our book club meeting. Thanks, Susan! Susan Quilty is an indie author who writes novels featuring strong women in unusual circumstances, often with a sci-fi, fantasy, or psychological twist. She is currently writing The Psychic Traveler Society, a young adult series. The first book in the series, Healers and Thieves, is available now.